OOSSPartners are leading members of the ophthalmic industry and the medical community who support the work of OOSS in a variety of ways. The OOSSPartners Program offers three levels of involvement for qualified industry partners. Marketing Partners contribute to the sustainability of OOSS at the same level as member centers. Contributions from Marketing Partners underwrite the operational costs of OOSS. In return, Marketing Partners receive an introduction to OOSS members and strategic exposure for their products and services. Strategic Partners underwrite major initiatives and events, such as the fall Symposium and spring Perspective programs, with in-kind support and financial contributions. 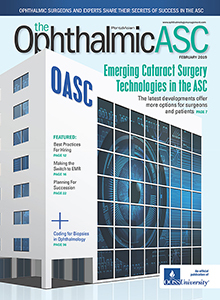 Strategic Partners participate in and support advocacy efforts, provide research and enable OOSS to maintain its leadership position in representing the interests of the ophthalmic ASC. Strategic Partners receive major brand recognition for their efforts and have regular, direct access to OOSS leadership, in addition to receiving introductions to members and strategic exposure for their products and services. OOSSPartners receive benefits tailored to their levels of participation. One introductory e-blast emailed to OOSS members with an "interest" link to the partner's dedicated page on the OOSS website. A personalized landing page on the OOSS website with an “interest” link to the partner's company website. Link-tracking analytics are included. Rotations on the OOSS website home page banner with a link to the partner’s company website and link-tracking analytics. Website directory listing with direct link accessible to OOSS members and link-tracking analytics. Website login at the member level with access to the ‘opt in’ member directory and other member-only resources. Access to membership mailing list, updated annually. Resource Partners receive enhanced member introductions and access, as well as co-branding opportunities to participate directly in OOSS programs and strategic initiatives. They also receive recognition for their contributions to seminars, webinars, OOSS answers and other educational initiatives. Resource Partners also are introduced to the OOSS Board of Directors at a regular annual meeting. Two introductory e-blasts emailed to OOSS members with “interest” links to the partner's dedicated page on the OOSS website. A personalized landing page on the OOSS website with an "interest" link to partner's company website. Link-tracking analytics are included. Rotations on the OOSS website home page banner with a link to the partner’s website and link-tracking analytics. Participation in an event, webinar, course, article or report, including co-branding opportunities and related benefits. Access to the membership mailing list. Invitations to President's Council events. One Partner Seat on the President’s Council. Strategic Partners receive enhanced partner benefits and exclusive co-brand alignment with one or more major OOSS event and/or initiative. Strategic Partners also are invited to participate in an annual Partner Roundtable with the OOSS Board of Directors to review agendas for advocacy, membership, program development and related strategic initiatives and to contribute to the strategic planning process of the board. Strategic Partners also have input into the development of industry surveys and receive the results of these surveys. And they are valued partners in the advocacy effort on behalf of the ophthalmic ASC. Three introductory e-blasts emailed to OOSS members with an “interest” links to the partner's dedicated page on the OOSS website. A personalized landing page on the OOSS website with an "interest link" to the partner’s company website. Link-tracking analytics are included. Rotations in the banner on the OOSS website home page, plus brand exposure on the OOSS home page partner banner and link-tracking analytics. Two Partner Seats on the President’s Council. participation in program and/or initiative planning, speaker/panel presentations, demonstrations, publications and reports. co-brand recognition on website banners, e-blasts, invitations, slide and podium presentations, audio/video captures, initiative announcements and registrations and related communications.